Issue #3 of the newly launched UK based Rock Candy Magazine features an exclusive candid interview with former STYX vocalist and keyboardist Dennis DeYoung where he makes an emotional plea to his former bandmates to get the classic line-up back together. DeYoung, the voice behind such Styx classics as ‘Come Sail Away’, ‘Best Of Times’ ‘Pieces Of Eight’ and ‘Babe’, used the interview with respected British rock journalist Derek Oliver to urge Tommy Shaw, James ‘JY’ Young, and Chuck Panozzo to put their differences with him aside. And he wants the classic Styx line-up to reunite for one last tour, a tour that would surely play to packed houses worldwide. DeYoung recognises that there are some significant hurdles to get over if every pomp rock fan’s dream is to become a reality. But he firmly believes the classic Styx line-up – himself, guitarists and vocalists Shaw and Young and bassist Chuck Panozzo (drummer John Panozzo sadly died in 1996) – would be able to serve up an unforgettable live show. Read the entire incendiary article in Issue #3 of Rock Candy Magazine. Rock Candy Magazine is a self-funded 100-page, full-colour bi-monthly rock magazine available in glorious print and in digital format for everybody who buys a print edition. 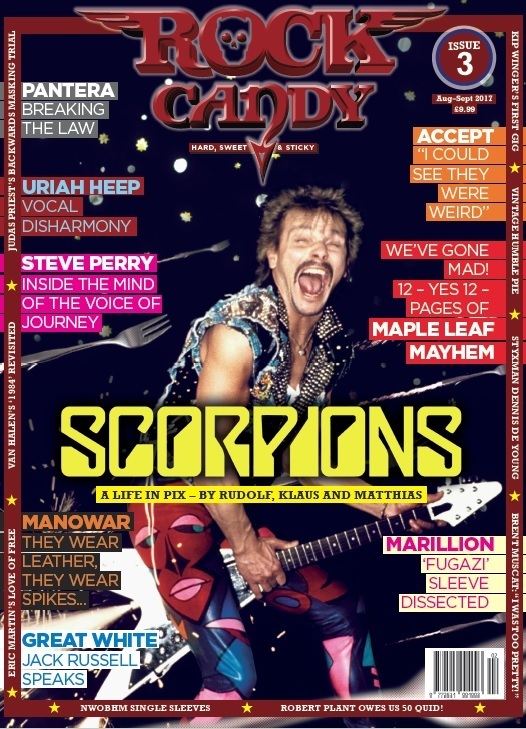 You can only buy online at www.rockcandymag.com. Rock Candy Mag covers the sights, sounds and smells from the greatest era ever in hard rock music, the ’70s and ’80s. The mag is proudly, flag-wavingly, unapologetically nostalgic. Why? Because we think rock’n’roll was better then. Rock Candy Mag is put together by respected UK rock journalists Derek Oliver, Howard Johnson and Malcolm Dome. They all worked at Kerrang! in the ’80s, saw everything that went down in this classic period – and lived to tell the tale! The mag is self-funded and is 100% fueled by passion for the music. Derek Oliver signed Pantera and Dream Theater when he was an A&R man in New York, and now also runs Rock Candy Records, the world’s greatest rock reissues label.